Women needing a nudge to tend to their friendships with other women. 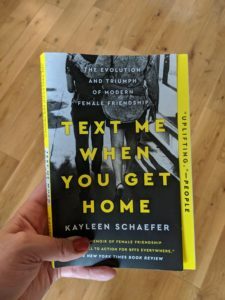 Through memoir and research, author Kayleen Schaefer explores the special bond women share, and how those bonds can be tested by society. After moving back to London early last year, I’m simultaneously far away from some of my closest girlfriends and working on deepening new relationships with girlfriends I’d moved away from eight years ago. And trying to figure out how to do this in ways that make sense. I haven’t ever had a squad of girlfriends. I wasn’t someone who shied away from having women friends (or girls as friends when I was kid); I just preferred more 1:1 time. At most, a group of three (including me) felt the best. I’ve never had long lists of close friends — or even not-so-close friends — I’ve just wanted to spend quality time with people who get me and who I get. Right now, I’m dealing with a lot of different issues related to friendship. In addition to leaving my hometown after high school, I’ve made four big moves in my life where I’ve physically left friendships. During each move, some friendships dissipate, which isn’t necessarily a bad thing; friendships don’t need to last a lifetime. But at the same time, especially as I get older (40 next year), I recognize the value, power, and beauty of someone having known me at different stages of my life, and me having known them. In fact, one of my closest girlfriends and I had a chat maybe five years ago, when she was dealing with some challenges as a parent. She shared how important it was that she still had friends like me and another of her close friends, who have known her since before she was a mom. We knew what she was like before, and could help her see how she still was that same woman in many (but not all) ways. I’m also dealing with a friend who has, for lack of a better term, ghosted me. We’ve known each other for 16 years, and had stayed (what I thought was) good friends through her moving away, then me moving near her, then me moving away again, and now me being back in the same city. But as much as I’d thought and hoped that we’d pick up where we left off, I’ve not heard from her in months, and I don’t expect to. That’s hard. That’s all background to say that when I saw this book, I knew I needed it, because I needed not a reminder that friendships are important, but permission to focus on making sure the existing friendships I have are tended to. Of course not all friendships will stay the same, and not all will need — or deserve — the same level of attention. But if we want to keep those relationships up (and we should), we need to work at them. And not as an afterthought. Author Schaefer looks at the friendships girls and women have with each other through different stages of life. She focuses on how she treated female friendship first as a child in school (and examines the idea of ‘mean girls’), then as possible competition at the office, and then as a primary relationship in one’s life. She looks at the history of women supporting each other, and offers examples of times when women have supported their best friends through serious, trying times. She includes examples from pop culture as well as from people she knows. She makes a strong case that we need to be supporting people in their friendships. The relationships we have with our partners (if we have one) or our kids (if we have any) are important, but friendships should be up there as well, and deserve our time and energy. Of course, that could seem like just one more thing we have to learn to juggle, but I think it’s more like something that, if we make the time, will give us much more than it takes from us. The book obviously stirred up a lot in me, but I’m not sure it is a great book. I think it is good, and perhaps I was expecting less anecdata and memoir (which is on me, not the author), but it felt like some things were missing. There are also some areas where the author does demonstrate some ignorance (one section talks about women entering the workforce in the 50s which, I think she meant fairly well-off white women, because poor women and women of color have been working forever). In spite of that, I do think this is worth a read. I could write more, but I’m off to dinner with two of my girlfriends.